In November 1990, upon Ethniki Insurance’s respective request to the Directorate for the Conservation of Antiquities, Ministry of Culture, the first inspection of the former underground detention centres of the German Kommandatur was realized. As ascertained, the graffiti and writings on the walls, metal doors, windows and tanks that comprised texts, names, dates, drawings etc. by the detainees of that period, were in poor state. In the second basement area, the high percentage of moisture caused by rainwater accumulation in the building’s lightwells and the subsequent covering of all wall surfaces with nylon sheets that prevented evaporation had resulted in making the mortar brittle and causing some parts to collapse while destroying parts of the latest lime wash layer (of 1944). The above damages rendered visible, in great many parts, the existence of at least two previous lime wash layers that apparently contained pieces of information from 1943 and 1942. On the metal surfaces of the doors and windows in the same area, the presence of moisture that had resulted in metal corrosion caused very serious deterioration in the oil-based paint coating film, threatening to destroy the alleged information. 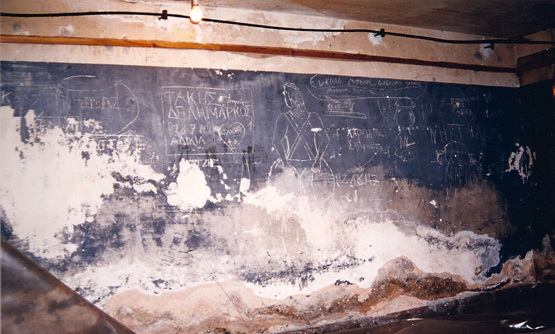 In the first basement, ‘purposeful’ later interventions on the surfaces of the walls, doors, windows and tanks had resulted in covering almost the entire 1944 lime wash layer as well as the initial oil-based paint on the metal surfaces and in the loss, in many cases, of graffiti and writings as indicated by the removal and stripping works. Final aesthetic restoration and protection of the area’s surfaces. In the course of the conservation work, a significant number of paper, metal, glass and other objects was found in the tanks, metal door recesses and sewerage watertight manholes. The paper objects found consisted mostly of detainees’ notes, paper cuttings (newspaper clips, coupons etc.) and every day object packs and wrappers (cigarette packs, matchboxes, and candy wrappers). The state of this material was poor since, for almost half a century, they had been tossed in dusty corners of the detention centres or crammed in metal frame recesses. 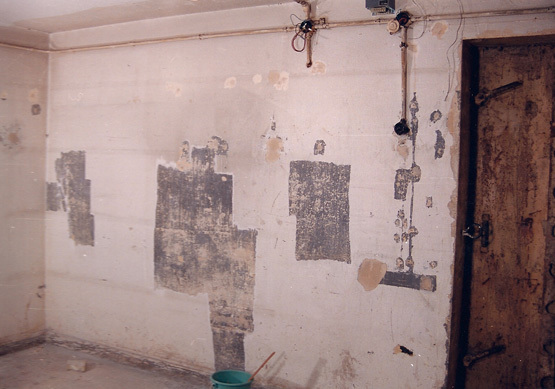 Oxidization, dust, moisture spots, biological and mechanical strains were the main damages that needed to be addressed in the course of the conservation works. Disinfection, grit removal, paper chemical neutralization and repair of mechanical damages, together with reinforcement of the material’s strength, were the primary objectives for all the objects involved. The work required particular attention and care due to the fragile state of the damaged material, which, in many cases, had disintegrated to a large extent. 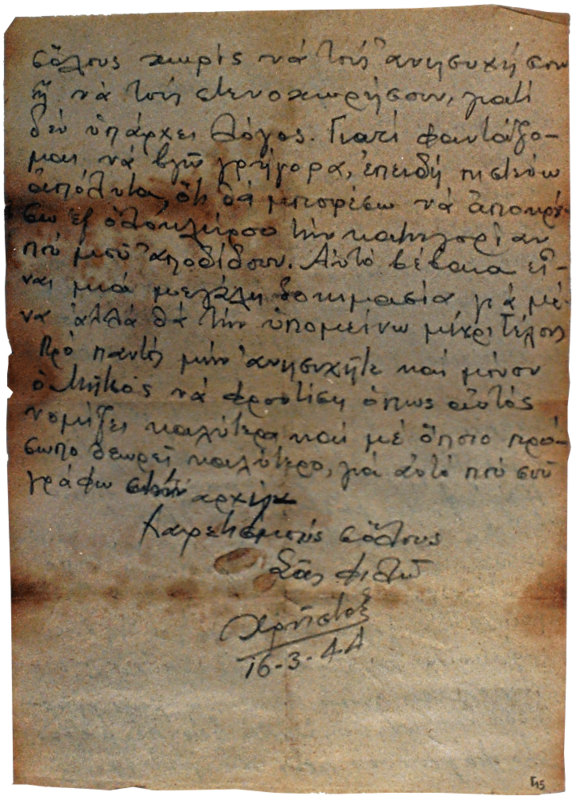 The most interesting objects from a historic perspective were selected for exhibition purposes whereas the bits and pieces or the non-written material was placed, after conservation work, in dedicated polyester folders to be stored in Ethniki’s archives. The conservation work on the paper material was organized and monitored by Ms. Ioanna Konstantinou, Assistant Professor on Paper Conservation, Athens TEI, and former head of the conservation laboratory of the National Bank of Greece Cultural Foundation. Metal objects presented similar problems. Two cups, a can of Italian origin, a small cigarette case, a handcuff part, bullets, razors, etc. were found with their surfaces in a state of advanced corrosion due to the unsuitable environmental conditions. The oxidation results altered their shape and concealed possible information on where they came from. In order to be rendered fit for presentation as exhibits, cleaning, corrosion removal, fixing and protection works were required. The environmental parameters required in the basement areas and the exhibit displays were examined with the utmost attention. In the course of the works, moisture and temperature levels were measured and a respective report was prepared together with Mr. Nikos Beloyiannis, Chemical Engineer, Stone Centre, Ministry of Culture, who performed analyses of the mortar ingredients on the memorial walls. All the afore-stated stages of conservation works were documented and photographed in detail. In 2008, the Directorate for the Conservation of Ancient and Modern Monuments undertook conservation work on the sizeable German flag that was exhibited for many years inside the memorial site. The woollen flag was in relatively good state, however, due to being exhibited in an ‘open environment’ (wooden crate with canvas) and the inadequate protection of an acrylic sheet cover that had been placed in the past, its surface had been subject to a lot of surface contamination. It had also been attacked, to a small extent, by insects that had opened small holes here and there. The flag underwent mechanical surface cleaning and repair works locally with silk fabric and silk fibre. In order for the flag to be re-exhibited, a new display was created in compliance with museum specifications whereas the flag was supported with a custom-made reinforced panel made of acid-resistant materials in order to give the impression of a waving flag.